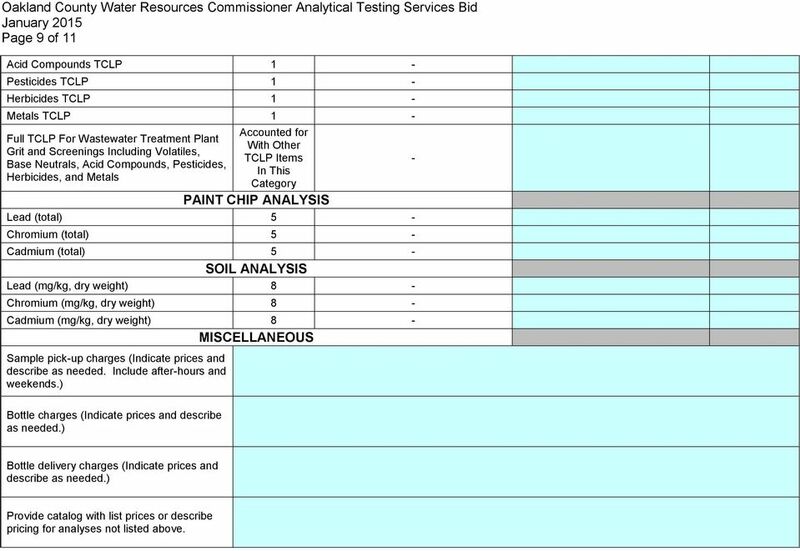 Download "The purpose of this bid is to procure a contract with a laboratory to provide analytical testing services on an as-needed basis." 1 Page 1 of GENERAL The purpose of this bid is to procure a contract with a laboratory to provide analytical testing services on an as-needed basis. Special consideration may be given to laboratories certified by nationally recognized certifying/accrediting agencies such as NELAC/NELAP, A2LA, ELAP, etc. Laboratories shall submit with their bid any certifications they may have for each item under the PROPOSAL section for which a price is submitted. 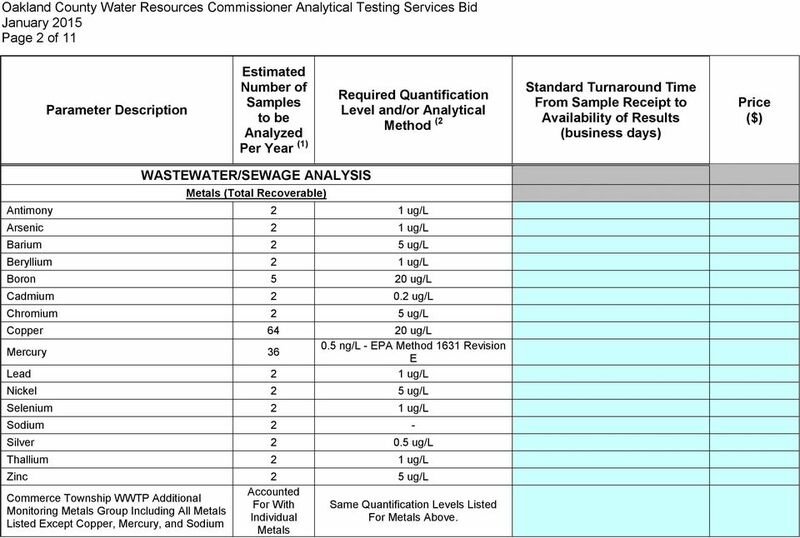 Laboratories submitting prices for wastewater analyses must participate in annual EPA/DMRQA studies. 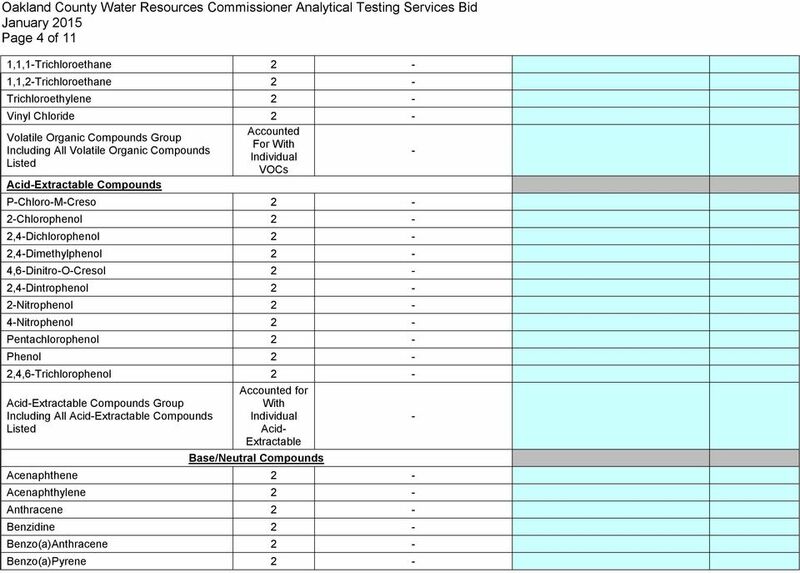 Laboratories submitting prices for drinking water analyses shall be certified by the State of Michigan. 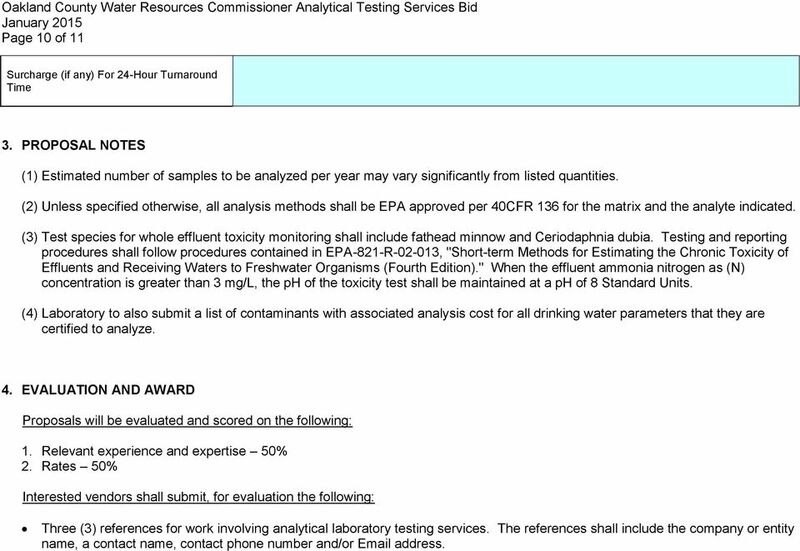 Oakland County reserves the right to award portions of the contract for specific analyses to different laboratories based on individual prices. 2. PROPOSAL DMR QA Study Testing: two chronic test species: each Prompt Payment Discount: % discount for invoice payment made within days of invoice date Bidders shall complete the table below as their proposal. Please complete all shaded areas with number, dollars, or N/A. 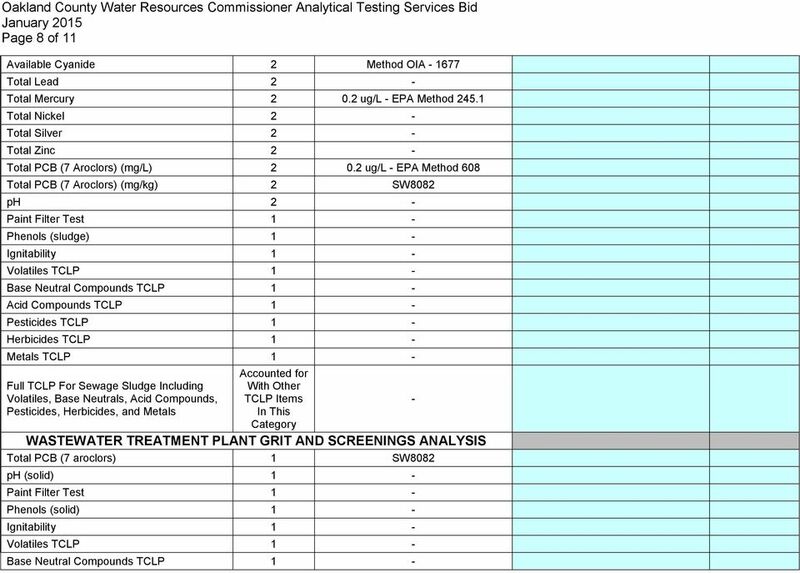 9 Page 9 of 11 Acid Compounds TCLP 1 - Pesticides TCLP 1 - Herbicides TCLP 1 - Metals TCLP 1 - Full TCLP For Wastewater Treatment Plant Grit and Screenings Including Volatiles, Base Neutrals, Acid Compounds, Pesticides, Herbicides, and Metals Accounted for With Other TCLP Items In This Category PAINT CHIP ANALYSIS Lead (total) 5 - Chromium (total) 5 - Cadmium (total) 5 - SOIL ANALYSIS Lead (mg/kg, dry weight) 8 - Chromium (mg/kg, dry weight) 8 - Cadmium (mg/kg, dry weight) 8 - MISCELLANEOUS Sample pick-up charges (Indicate prices and describe as needed. Include after-hours and weekends.) Bottle charges (Indicate prices and describe as needed.) - Bottle delivery charges (Indicate prices and describe as needed.) Provide catalog with list prices or describe pricing for analyses not listed above. 10 Page 10 of 11 Surcharge (if any) For 24-Hour Turnaround Time 3. PROPOSAL NOTES (1) Estimated number of samples to be analyzed per year may vary significantly from listed quantities. 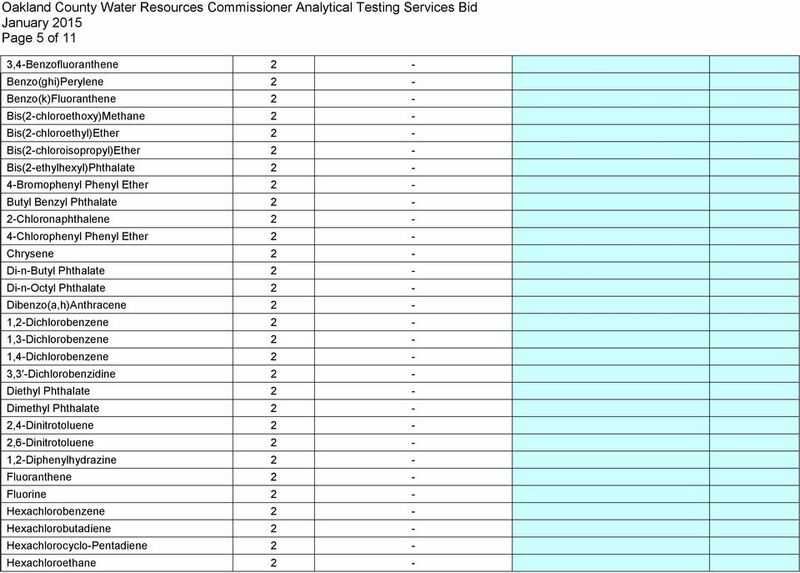 (2) Unless specified otherwise, all analysis methods shall be EPA approved per 40CFR 136 for the matrix and the analyte indicated. (3) Test species for whole effluent toxicity monitoring shall include fathead minnow and Ceriodaphnia dubia. 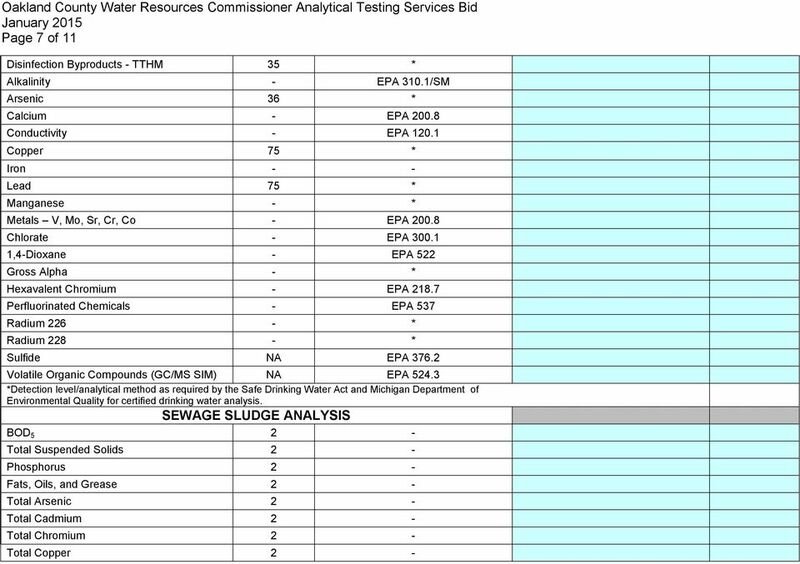 Testing and reporting procedures shall follow procedures contained in EPA-821-R , "Short-term Methods for Estimating the Chronic Toxicity of Effluents and Receiving Waters to Freshwater Organisms (Fourth Edition)." When the effluent ammonia nitrogen as (N) concentration is greater than 3 mg/l, the ph of the toxicity test shall be maintained at a ph of 8 Standard Units. 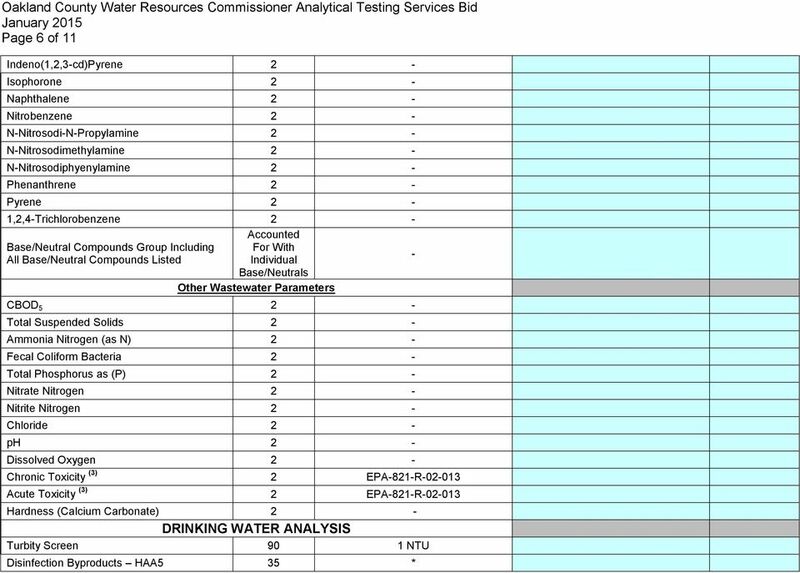 (4) Laboratory to also submit a list of contaminants with associated analysis cost for all drinking water parameters that they are certified to analyze. 4. EVALUATION AND AWARD Proposals will be evaluated and scored on the following: 1. Relevant experience and expertise 50% 2. Rates 50% Interested vendors shall submit, for evaluation the following: Three (3) references for work involving analytical laboratory testing services. The references shall include the company or entity name, a contact name, contact phone number and/or address. Village of Lockland, Ohio. What s On Tap? Questions or comments regarding the final action should be addressed to Stephen Boyer at (609) 633-3823 or sboyer@dep.state.nj.us. Chapter 9 RELEVANT INDIAN STANDARDS Table 9.1. 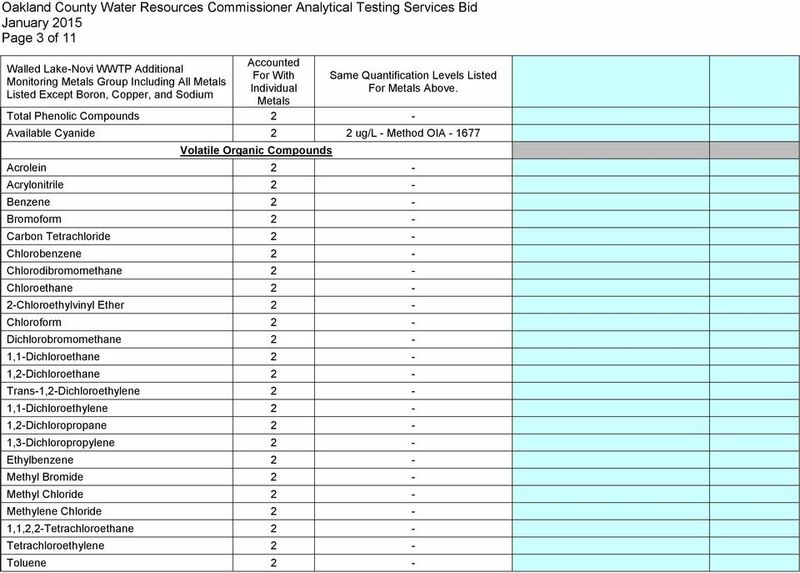 Surface Water Quality Standards (as per IS: 2296). Class A Drinking without conventional treatment but after disinfection. Class B Water for outdoor bathing.